Open Letter to FDIC Chairman Sheila Bair from Louis Hernandez, Jr., Chairman & CEO of Open Solutions Inc.
February Newsletter, 'Let's Recap, Shall We?' Cartoon, Austerity doesn't work -- time to try something new. October Newsletter, Public Banking is Counter-cyclical, Chile, Toronto, and Philly updates! Read what Thomas Edision and Henry Ford had to say about public debt. 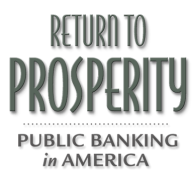 Return to prosperity is not just a slogan - it's they way you can get involved in your community and make a difference. You'll find a handbook and presentation that you can use to help educate others about the merits of public banking.